In Tech Time Saver #1, I summarized how RSS Readers such as Feedly, Zite, and Flipboard could save time by delivering pre-curated content to your web-connected device. My appreciation for Flipboard has grown substantially since reading Sue Waters terrific post on The Edublogger. Other than looking sweet on the iPad, Flipboard is fast becoming my favorite "do everything" app for information, learning, and sharing. Here is how Flipboard can be a time saver for connected learners like me. Flipboard can be used as a social media "aggregator". Social networks such as Twitter, Google+, and Linkedin, can be subscribed to, and reviewed alongside your favorite articles and videos. Efficiently, subscriptions can be created based upon social media criteria such as, Twitter hashtags, or Google+ circles. As with other popular RSS readers, your favorite content can be shared with a single click out to your social networks. Flipboard can be used as the "reader" for collections curated in other apps. For instance, I can subscribe to those favorite contributors that populate my Blogger reading list. I can check in on the "instructional technology" folder that I had previously set up in Google Reader. I can also subscribe to local news outlets. Flipboard can be used to create collections of web content that can be shared as "magazines" to social networks, or resources to be shared with students or colleagues. Others can be invited as contributors to the magazine, thus making collections collaborative. Much like Diigo or Delicious, Flipboard can be used for social bookmarking - identifying favorite web content and sharing it with relevant groups, and subscribers. Here is my first magazine, The Linked Learner, which I created and shared earlier this week. I also invited a few friends from my PLN to be contributors to this magazine. 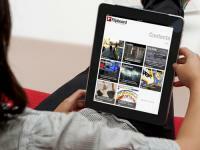 Flipboard can be used to create a repository for student blog posts, or tweets. Teachers can quickly read, review, and share student submissions from a single app. Students can collaborate to create class magazines that feature their research and learning. Students take particular pride in the number of subscribers and flips that their works receive. As you can see, Flipboard can be used to either supplement, or supplant other apps on your computer, tablet, or smart phone (Yes, Flipboard is device independent). These are significant considerations as teachers look to provide opportunities with focus and authenticity for their students. I plan to use Flipboard to supplement content for professional development to our teachers and staff. How about you? How will you use this versatile app to support connected learning? Glad my post of Flipboard helped. Our latest use has been to create Flipboard magazines for the Student Blogging Challenge so educators and students can easily look back at previous tasks in the series and look at student and class blog posts from the series. Hello Sue and thank you for your comment. You have inspired me to get more creative with our use of Flipboard. You're welcome! I should have warned you that Flipping can be addictive. I've got plans to turn out Teacher Challenge series into magazines once I finished the update so I can create it in order I want the posts and information to appear. I've also been using Pinterest a bit more. They both work well together.